Hi friends, I started this series about a month ago where all of us incurable blue and white lovers can come together and celebrate one affliction we are happy to have:) Seriously blue and white fever appears to have swept the country! If you have missed the other posts click here and here. I go into almost every store and there seems to be some form of blue and white wherever I look and lets not even talk about when you open a magazine! To me, it’s timeless and a classic but no doubt is enjoying a major resurgence. I have been noticing it everywhere lately! So every “club meeting” I pick a topic to discuss on blue and white. Today it’s about blue and white groupings. I love a grouping of blue and white, power in numbers! Of course balance is key and I personally am a fan of mixing styles, shades of blues and shapes. It is too boring and predicable to make everything so “matchy matchy”. I have compiled a collection of pictures that I think embody successful grouping/clusters of porcelains. This above and below was as show house I did of a beautiful patio space, I used different porcelain to fill the console, never too much! 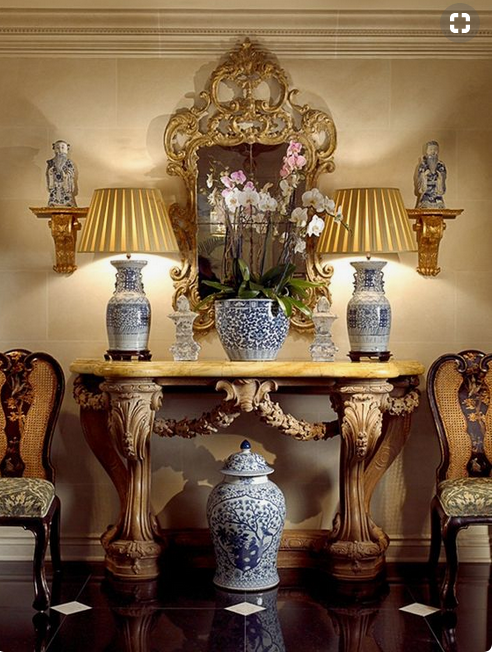 Love this grouping above and always been a huge fan of jars on brackets/sconces flanking a mirror…stunning! 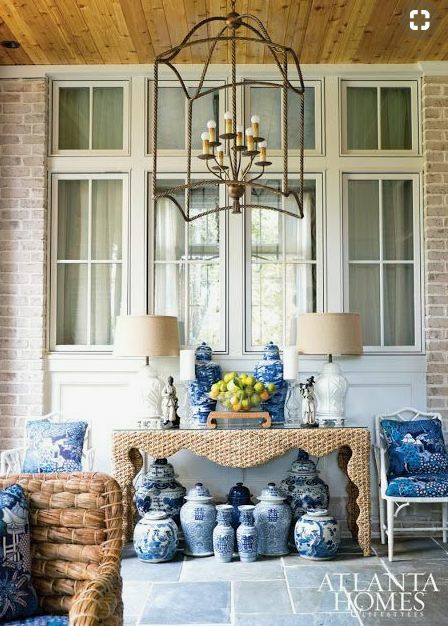 Have always loved a hutch filled with different types of blue and whites, plates, vases, jars, etc…. Love how Citrine Living groups her love of blue and whites together, so striking! Parker Kennedy shows beautifully that blue and white groupings are most certainly not only for the outdoors! One lucky blue and white lover will win this beautiful pierced plate to add to their own collection or to start a new one! Leave a comment here and I will announce a winner on Thurs. I love all gatherings of blue and white and all the versatility of it on a day to day basis ! Love it all! Gives me so many good ideas! I love it all! I was so thrilled for you and your many followers to see you reach 50,000! You give so much of yourself to so many of us who love following you. So much beauty and happiness. I don’t think I can say thank you enough times. I never get tired seeing such beautiful arrangements. Somehow the beauty of each piece still shines while collectively creating a visual treat. Blue and white never gets old . I always have blue and white in most of my rooms. Love seeing it in magazines ! Thanks for what you do . Just love this pierced plate! Don’t have anything like this in my collection yet……but hoping that I will soon! I love to group plates on the wall to accent furniture pieces. Need to work on adding in bigger pieces. Your posts are always so inspiring and beautiful. I have always been a huge fan of blue and white, so classic and so timeless! Love these posts. It’s fun to see how other people do their arrangements. I do not have a particular style with mine, just whatever mood hits me! Lovelovelove this post! I feel so inspired! Another inspiring post from you, Tina! Many thanks for all you do! Wow Tina. Another great inspirational post. SO ready for Spring and Blue/white outdoors! Absolutely LOVE It all! Can not get enough! Thank you for posting all of these beautiful pictures. What an influence you have had on the blue and white market. When I see it in stores my mind says, “Tina has done this.” You have greatly influenced my decorating as I am now transitioning from reds to blue and white. 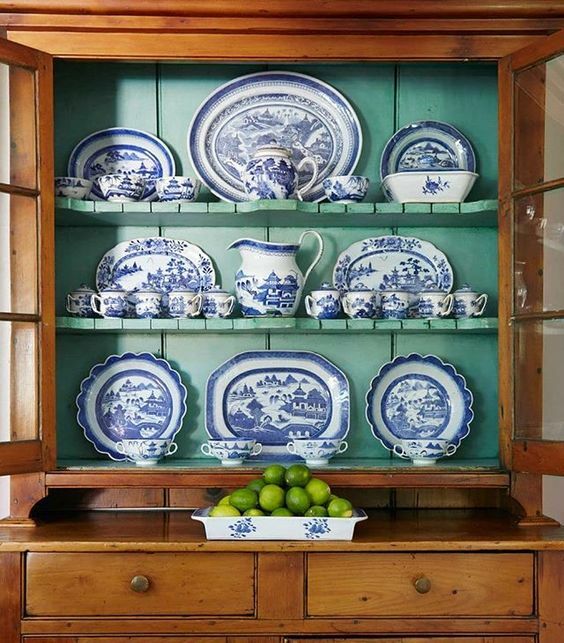 I especially like blue and white porcelain in a pine hutch, too. Your vignettes are so pretty. I always enjoy photos of your dining room and the many beautiful ways that you style your table and fireplace mantle. I think that I need to buy more blue and white from TEH! Oooh, the blue and white is so lovely. And not physically present in local stores, to my general frustration. I’d love to be considered for the giveaway, and I’ll look into your site for those lovely ginger jars. I, too, love all the blue and white groupings! I am glad to read that you change things occasionally; I thought I was the only one. But, according to the seasons, blue and white porcelain can be grouped using more pieces or in the spring, I edit the pieces out and focus more on flowers in my blue and white porcelain. The giveaway would be pretty with fruit in it, on a kitchen counter. Such a beautiful inspirational post!!! Can never have enough blue and white!! Your blog is a treat! Love all blue and white. Can’t wait to see PB decor! I really enjoy strolling through your lovely blue & white photos…they are very inspiring! While growing up my favorite color was clue. So, I admit it, I fought this obsession for years. However, several rooms are now painted blue and recently started for a great space to display my three pieces of porcelain. I have weakened and now you have an addict that now addresses her addiction. If only all addictions were as beautiful! Am just finishing a decor makeover and Blue and white has taken over my first floor! I love brackets with jars or plates. Looks fantastic and visually expands your decorating area. That is my favorite picture of Teddy! Just adore it!! Makes me smile. Blue and white- sometimes too much is just right! Love all the blue and white. I never tire of it! It is so wonderful to follow your blog….always something interesting to read or see. Never stop! Loving how blue and white works for all seasons. Happy spring! I just returned from Round Top Texas where I added to my blue and white collection. The one thing I don’t have yet is a bowl. Would love to have yours. All these images are out of this world gorgeous. The pierced bowl is so unique and would be happy to display it in my home. Tina, thanks for all you do. I loved my Easter table with 2 blue and white ginger jars with white tall candles in crystal flanking them. Beautiful ruffled pink tulips in the middle. It was lovely in my navy dining room. It looked so refreshing after all the dark days we have had! Love anything blue and white. As I like to say, “Good taste never goes out of style”. The patio you did for the show house was absolutely breath-taking. A definite WOW! Wonderful inspiration! 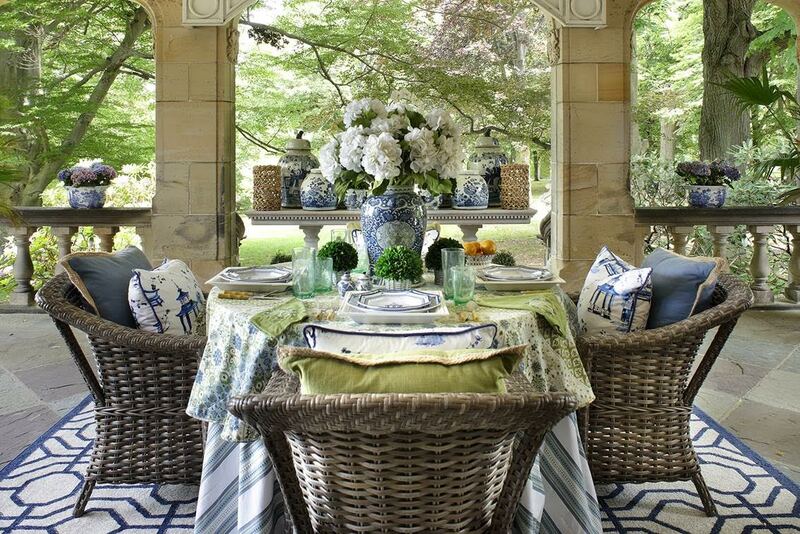 Love the blue and white on the patio. How can you not love blue and white. Been a lover since childhood. Every one of the photos are beautiful in their own right and full of inspiration. Thank you for always inspiring us each and every day. I so enjoy your posts, and don’t miss a one. Have a wonderful day, and I can see how much you still miss your sweet Teddy. Love how you end each post with his sweet face! I love every photo and it inspires me to continue changing my outdoor color scheme to blue and white with accents. Thank you for the beautiful photos and ideas. Happy spring! LOve the new melamine-adds to blue/white during outdoor and picnics. Loved today’s blog! I’ve always loved blue and white but didn’t think it “went” with my decor…boy was I happily wrong! I have blue and white everywhere now and love it! You just put some cheer into another very gray day in PA. Love my B/W and keep moving it around. For Easter I filled my latest purchase from your shop, a huge punch bowl, with daffodils and blue hyacinths. Looks great and scents the whole room. I have been a blue and white fan for all 45 years of my married life! Thankfully, I never wavered in my devotion, and now have a sizeable collection, which is so fun to play with and change often. Thanks for your inspirational posts! Your selection of pictures is always so “spot on”…absolutely beautiful and so inspirational. Thank you! Blue and white never gets old! Always looks fresh, especially after a long cold winter. So enjoyed your post today. Thanks for sharing all the inspiring pictures! Oh my! All so beautiful. I absolutely love that collection of photos! The giveaway bowl is beautiful. I just can’t get enough blue & white! I use blue and white in my kitchen; bowls filled with lemons, change to an assortment of colorful napkins, as well as, flowers. Loved the pierced plate! Would enjoy having it in my collection! Keeping my fingers crossed! Always makes me smile to see your blog in the morning. Would treasure this beautiful bowl! I am a blue and white addict! I think you can never have too much blue and white! I love the outdoor settings! So pretty. Beautiful and inspiring. I am just starting my collection of blue and white. Thank you for the Beautiful Design pictures of the Blue and White. Gives me so many wonderful ideas! I’ve decided to use the blue and white on my patio this year! The photos have inspired me! 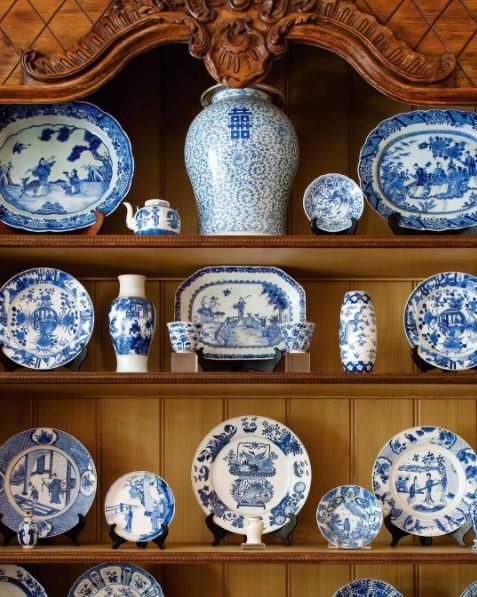 As a young girl I loved all the blue and white pieces in my mother’s home. Now I’m enjoying adding blue and white to my own home and hope my daughter will enjoy these pieces in her home one day. Great ideas. My porcelains filled with flowers always perk up otherwise drab arrangements. My Pinterest board is full of photos from your blog, and today is no exception! Thank you for making the world more beautiful, one blue and white ginger jar at a time! What’s old is new again! I have loved blue and white for ever and always decorated with blue and white before it was the rage. Now it’s back and I’m loving it adding updated pieces with the old. Thanks for so much inspiration. By the way love this bowl for the give away. 💙 blue & white and all the inspiring pics. Also, love this plate tour giving away. I love it all! I used a grouping of blue and white on my mantle with dried hydrangeas in winters past..loved it. Always had a love affair with blue and white. My very first set of dishes was the blue and white Coralle. LOL I still have blue and white in every room in my home although you wouldn’t necessarily notice that. It just goes with everything! It just goes with everything! Great inspiring post, Tina! Thank you! Always had a love affair with blue and white. My very first set of dishes was the blue and white Coralle. LOL I still have blue and white in every room in my home although you wouldn’t necessarily notice that. It just goes with everything! I grew up with Blue and White in our traditional family. It’s been fun what with the re-emergence ‘n’ all (Southern speak for “How nice it came back in style.”) Mom, my sister and I are showcasing pieces that some years took a back burner to more trendy items, and realizing we never stopped loving our Blue and White. Great post! Re-arrranging the top of the hutch in my dining room as inspired by one of the photos. All lovely and the giveaway would be a nice addition. Thanks for the ideas. Married almost 43 years and have always decorated with blue and white! Current favorite grouping is on the fireplace mantle: two tall candlesticks flanking a picture of a Highlander bagpiper and a bowl of yellow tulips between them. Blue and white is so timeless and fresh! Like a beautiful mirror, b&w is akin to another light source in any room. Every time I think, girl…you have enough….I see something else I love and manage to fit it in somewhere!!! My favorite display belongs to Furlow Gatewood. Loved seeing all these groupings! Made me realize I need a few more pieces that are paired. Loved the balance of paired pieces with singles. Beautiful! I use blue and white everywhere:. On brackets, in cabinets with glass door inserts, on library tables, on bath vanities, etc. My favorite is on bookshelves with painted backboards mixed with antique books and antique Virginia metalworks trivets. Now I want to paint the back of my pine hutch! Just lovely! Blue and white groupings always bring a smile to my face😃. All the photos are so inspiring and beautiful. It’s been so chilly and dreary here in Northern Illinois. All of the pictures today were so inspiring! Thank you! Tina, You have done so much for Blue and White. I have loved it for years – so classic. Keep up the good work! I especially like the Citrine Living photo with the pillows beneath. Lots of nice ideas in this post. I use a little museum putty to ‘fix’ my items in place on brackets and ledges! LOVE blue and white! I can never see enough blue and white! I enjoy all of these posts! I like a cluster of blue/white ginger jars, etc. on the DR table. Blue and white in a cluster setting is such a pleasing visual. Add some beautiful flowers… Even better!!!! Thanks for offering the discounts !! 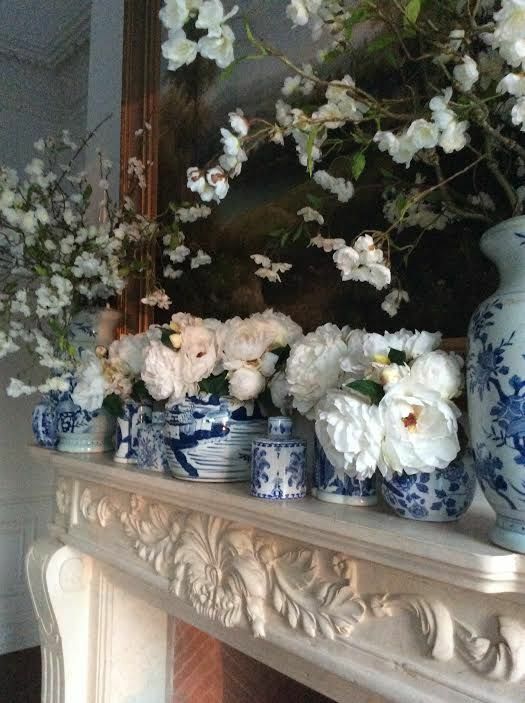 Thank you for sharing the blue and white beauty of your collection. True LOVE !!! That’s what blue and white is to me. Great inspiration! Just in time for spring, if spring ever gets here! Your posts totally make my day! 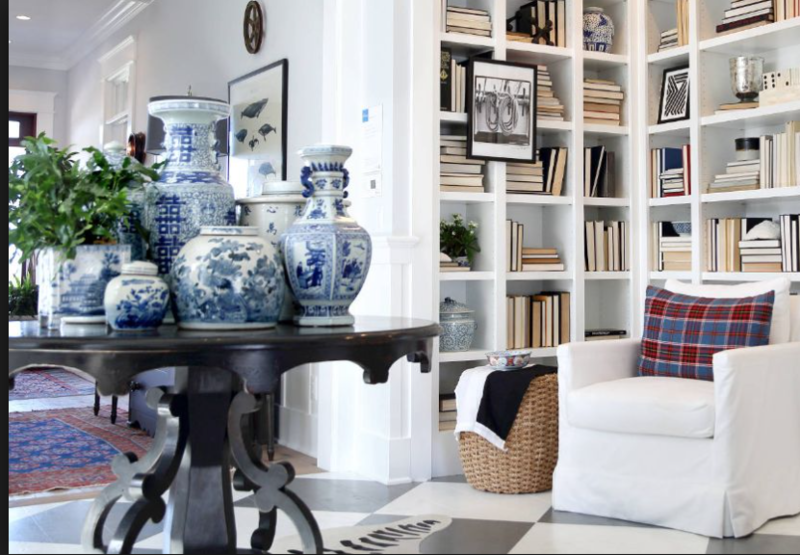 I have loved blue & white all of my life & use it in every room of my home & office. Your ideas are truly enchanting! Great post! Good vignettes make a home look so put together. I’m working on that in our new home. Need visual layers! It’s been warm here and things are blooming so I decided to move my garden stools into the garden. I also placed some jars on the patio table. I sprinkled in some white hydrangeas to celebrate spring. I really enjoyed reading your blog and looking at all the creative ways to show off blue/ white. Now I have to run over to the porcelain page to see what’s calling my name! Happy Spring! The displays of the blue and white are beautiful and inspiring. Blue and white always makes a room look so fresh. Thank you for the beautiful photos and great ideas. These photos were an inspiration! 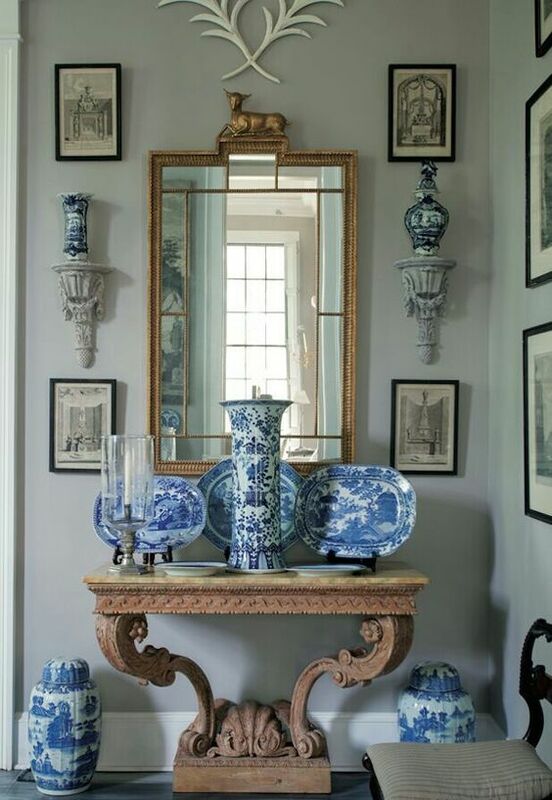 I will never tire of blue and white porcelain. Even our powder room is covered in Ralph Lauren wallpaper with a large pattern of blue and white jars and plates. The porcelain is so versatile. I’m always reconfiguring mine and using it for decor and entertaining. I’m definitely a member of your club, Tina! Loving the blue and white on brackets! my Goal is to make my blue and white collections work in areas that I haven’t thought of. Teacups in canisters, etc. Just spreading the joy. Blue and White is such a classic look! All your photos are amazing! While I try to downsize, your photos with your groupings of jars, vases, flowers, validate my need to make vignettes with cluster of items. Minimalism may be one way to decorate, but I love that you are not one of them, inspiring color and collections with your blog. Thanks so much. fond memories of them and fit right in to my home today. Keep those pictures coming! I enjoy this so much. My world is blue and white with a touch of Tina. All so beautiful! So pleasing and soothing to the eye! Love it! Love adding Chinese B&W to a room, even though my rooms are not B&W. I have two larger ginger jars that flank my dining room fireplace and inherited a lovely large bowl that I fill with ice and use as a beverage cooler when entertaining. 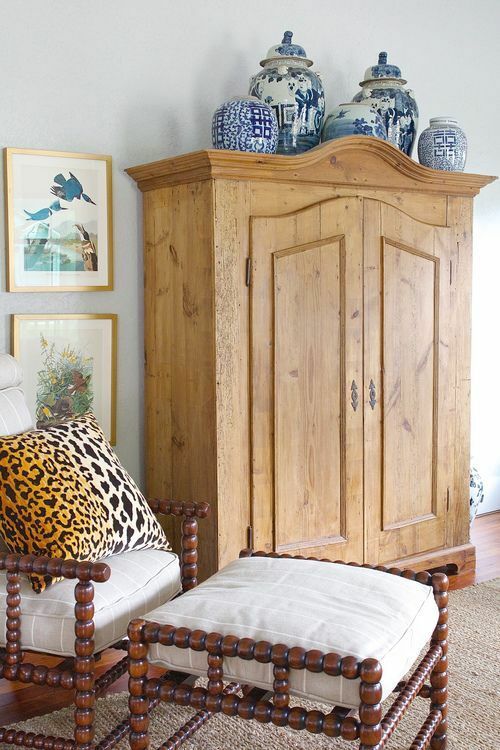 As long as a) an item is in perfect condition and b) I love it, I will find a way to make it work in a room. Love the contrast of that wonderful aged green hutch interior with the collection of B&W. What a beautiful representation of blue and white groupings! I just love this color combination. I like to use various size containers and vases for flowers. On the dining room table is a very large blue and white bowl filled with potpourri or moss balls. Love all the pictures today and I got some great ideas for grouping my pieces together. Thanks for sharing and hope more warmth and sunshine are coming your way. Thanks for all the great ideas! Now I definitely need more blue and white pieces! Love seeing the outdoor photos. The combination of Blue and White alongside natural greenery, flowers, and relaxed outdoor furniture in rattan or wrought iron is perfection! Timeless and classic! Great post! Less is more does not apply to all things blue and white! Love these pics! I am new to the world of blue and white/enchanted home. My first purchase was a pair of Staffordshire dogs in Cream. That are just beautiful and the cream color allows for much versatility. Thank you. 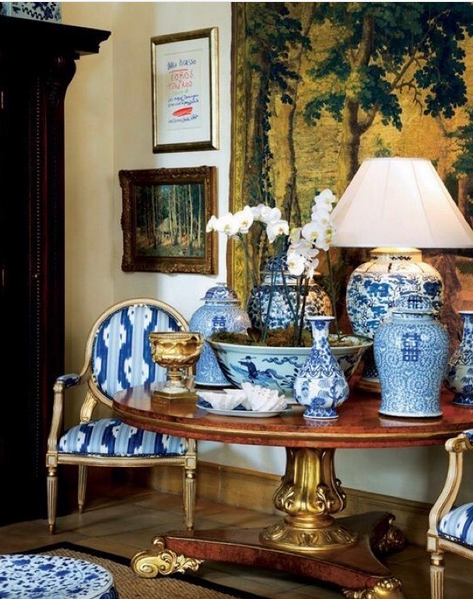 Thank you for this post showing inspiration for blue and white groupings. Thank you for the wonderful blue & white pictures. They make me want to start a collection! I LOVE your BLOG! First place I go every morning. Thank you for the joy you bring me. Love, love, LOVE all things blue and white! The pierced plate is gorgeous! I do think I may need to start a collection of brackets to display MORE blue and white!! True love!!! That’s how I feel about blue and white. I just love blue and white! I can never have enough! The layout designs here are beautiful! Thanks for a great “club meeting” ! These photos are really inspirational. 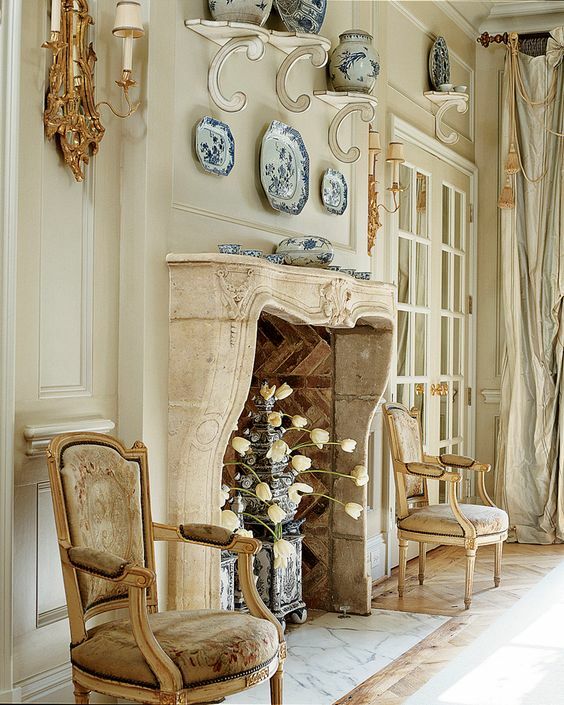 Timeless,classical, and oh so lovely ! Love your blog and all blue and white especially the delicate lovely give away piece. Thanks for all the inspiration! I love, love The Blue and White Club! Thanks, Tina! I’ve been in love with blue and white since I was a teen…Half a century later and still in love! Great inspiration! Can’t wait to get my blue & white out of storage and start experimenting! Love all the blue and white. I think I need to add some more to my collection. You can never have too much. I have loved blue and white for a long time. It is classic! The footed plate is gorgeous and would complement another that I have. I filled it with hand painted Easter eggs each year and also use it to float camellia flowers. It’s a great look! Perfect blue and white collections. It would be perfect on my table. So fun to see all the blue and white. It made my day! The blue & white posts are so lovely! The pierced plate is gorgeous! Blue and white porcelain goes with everything! Blue and White is timeless!!!!!!!!!!!!!!!!!!!!!!!!!!!!!!!!!!! So much great inspiration there. I just finished adding blue to my porch. Love it all. Love, love, love your photos!!! 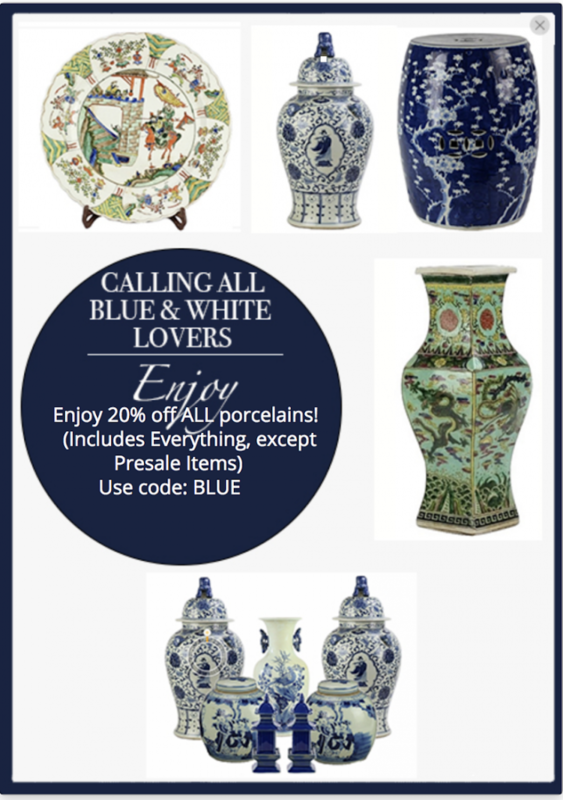 I am beginning to collect blue and white porcelain and have gotten so many wonderful ideas from you. Many thanks!!! What a great post. I have a nice collection of Blue and White and never tire of it. I now have both my daughter and sister started with their own collections. Look forward to more use of blue and white in the future. Great photos I love it all. I have been officially dubbed a “blue and white fanatic” by my dear husband. Tina, what an encouraging post to get everyone excited about tweaking for Spring with the blue and white. So many beautiful ideas to choose from. Of course, your collection meets my taste perfectly. Look forward to ALL your ideas. Thanks for sharing. Love the idea of adding brackets to display blue and white. I’ve never been the same since the purchase of my first piece of Blue and White. So many beautiful ideas in today’s pictures. Love them all. Love everything Blue and White. Adds a touch of class and timeless elegance to any room. For Easter I put forsythia branches in my ginger jars on the fireplace mantel. You can tell I’m truly inspired by ready ur weekly blogs! Beautiful pictures in this post, which truly inspire me! 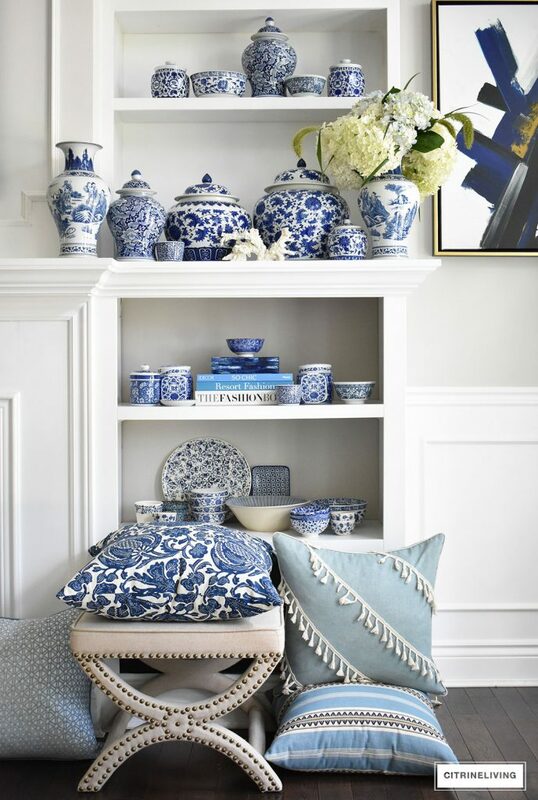 Blue and white collections make my heart skip a beat! Please enter me in the giveaway for the pierced piece. I would truly love to own it!! Blue and white transcends time and tradition. It never goes out of style. It always looks fresh, clean and sophisticated. 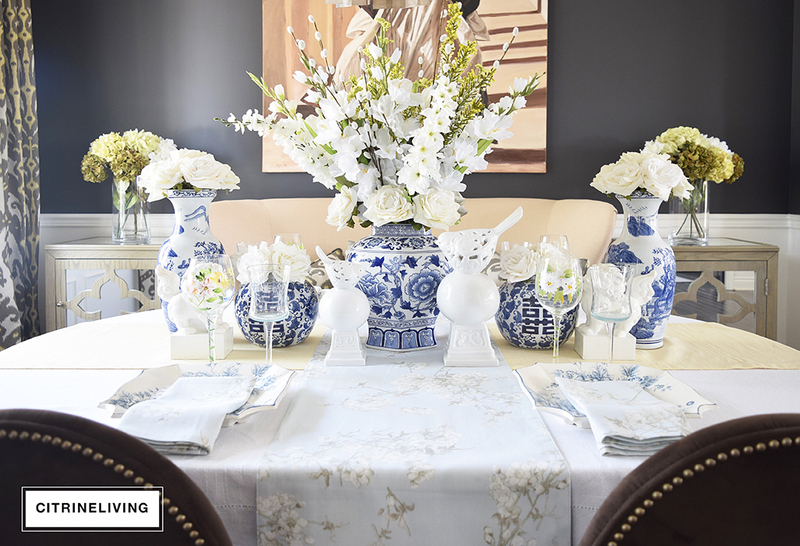 I love all the blue and white vignettes with flowers arranged in them. So elegant! Tina thank you for the inspiration! It’s lovely spring weather here in Dallas and your post has given me great ideas for adding blue and white to our outdoor areas. Heck, I’m even going to have our house painted white! 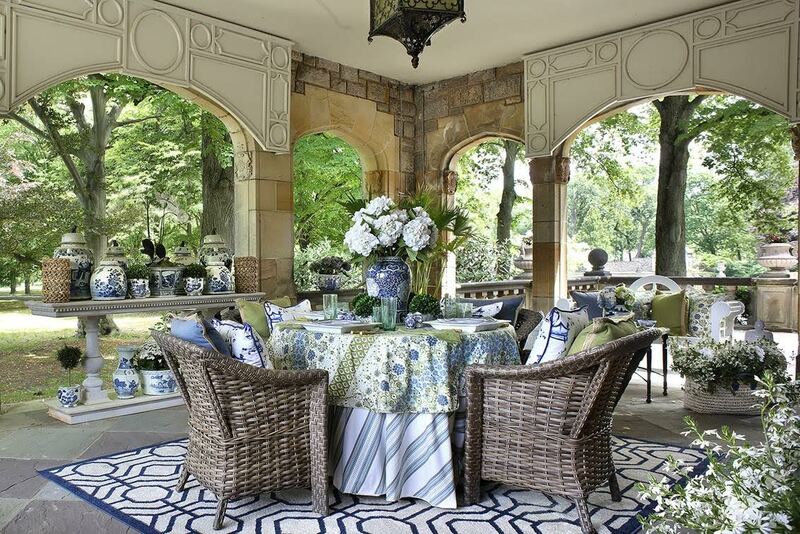 Love the way you decorated the showhouse covered patio. Beautiful. Teddy is my second favorite blue and white picture. Love the pierced plate. It would look so nice with my other blue and white pieces. As always, I thoroughly enjoyed your post and have found renewed inspiration for my decor. Thank you for posting all these beautiful pics….just what I needed on this very gloomy day….very inspiring! This little blue & white dish is precious…fingers crossed. Blue and white is timeless and classic. From the time I was a little girl growing up in the countryside with lush fields and mountainous rises, I’ve dreamed of my English ancestors. As I grew older, I began to appreciate all things English, starting with blue willow and English staffordshire plates. My first apartment was planned around a blue and white dish; although it may have been Chinese or American, it had that look. Blue and white still speaks to me, at 70 years of age. It will be a part of my legacy! I am just getting started on my blue and white collection. I am hooked! Love all of the blue and white groupings! Thanks so much for all the ideas! I love the pierced plate on pedestal. It would look beautiful with my small collection of blue and white. Thank you for the chance to win such a pretty piece. No one does it like Furlow!!!!!! I have always liked a blue/white combination. I can pair it with ANY color. Whether it’s in the pastel, jewel or even primary color family, it always makes a statement.. With dark wood or light, the colors blend in beautifully.. Formal or casual settings, it fits in. So versatile. The blue and white combinations are lovely. Blue is my favorite color, so I am partial to this combination. Thank You for the opportunity to win this lovely piece. Blue and white is always a standout together. Never too much blue and white! Always adds something to every space, indoors or outdoors! I love blue and white, it’s so classic. I just hope it doesn’t become overdone! Thank you for sharing those beautiful pictures!! Many wonderful ideas!! I am always moving my blue and white pieces around the rooms! They are versatile, so easy to add or subtract! I love the blue and white club! So much beauty out there. 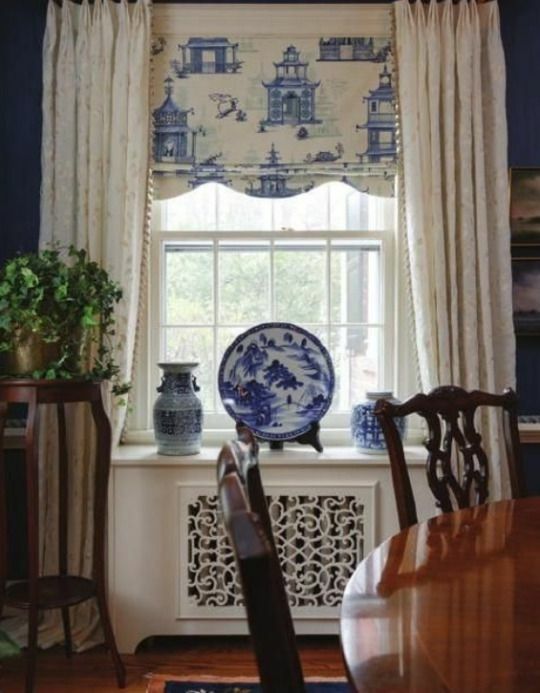 I would really love to see brackets in your line ~ that is a wonderful way to display any gorgeous blue and white pieces! Would love to win the beautiful blue & white piece. The pierced plate makes my heart jump! Reminds me of the pierced serving pieces my grandmother in Charleston used to use at our family dinners. This whole post just takes my breath away! The pierced plate is stunning! The room with the jars on the hutch—it’s not a blue and white room, think the jars add so much more to a room that’s in a different palette. So many lovely blue and white groupings! Giving me lots of good ideas! When the time comes, I’m requesting a blue and white urn for my ashes!! How’s that for a blue and white lover???!!! How gorgeous every picture is. Thanks for the inspiration! I especially love the picture of Teddy in the blue scarf. I know you miss him. Your pictures of blue and white are so inspiring!! Have always loved this look. I love blue and white so much and I have you to thank. 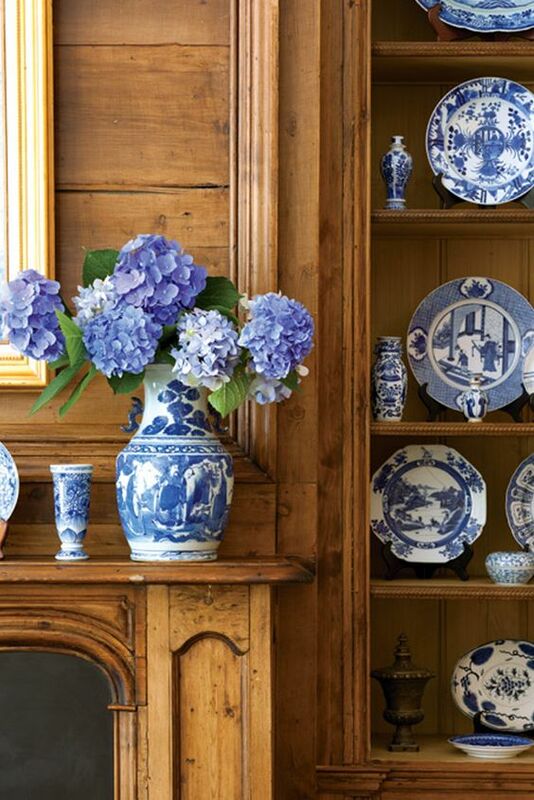 I especially love blue and white in grouping with the warm wood of a mantel or cabinet. So pretty! En masse! The more, the merrier! I will have to say that you have had some part in the resurgence of the classic blue and white decor! Love your instagram photos. Such great inspiration. You are the real deal. Dreamy!! 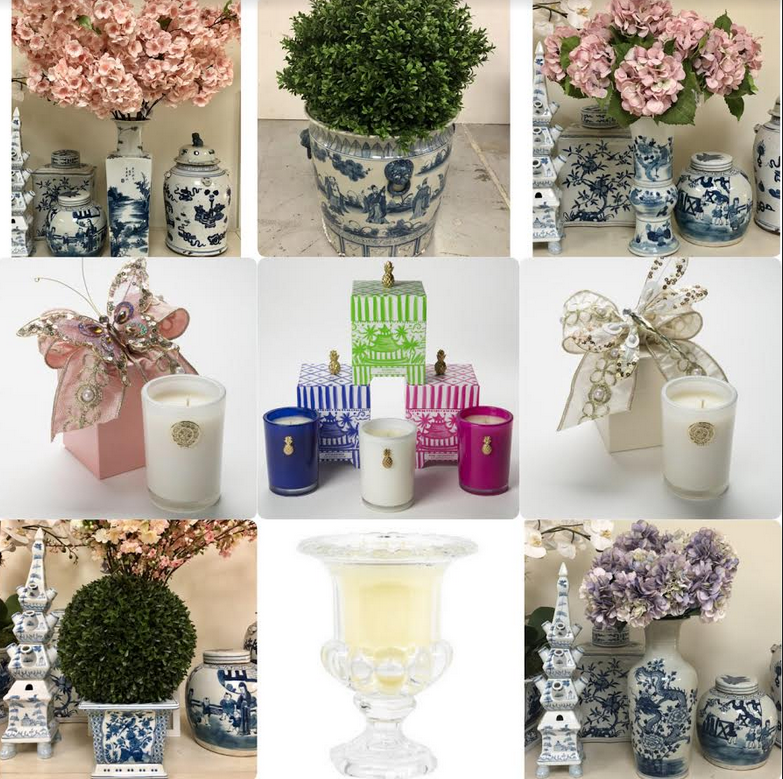 So many beautiful ways to bring blue and white into my home!!! I just can’t get enough of it!!! I like to add fresh flowers in small groupings of vases. Love the collections displayed! So many wonderful ideas! Thanks for the blue and white eye candy Tina. 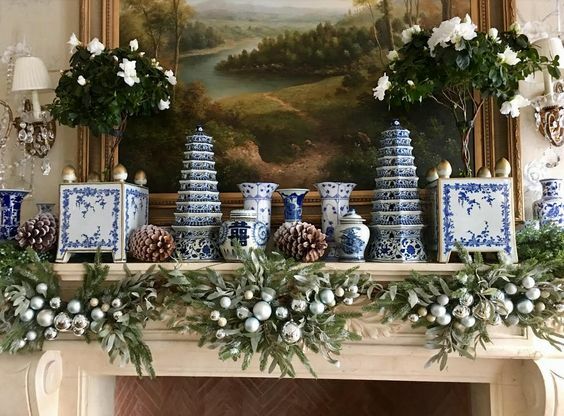 My entire mantle is filled with blue and white. 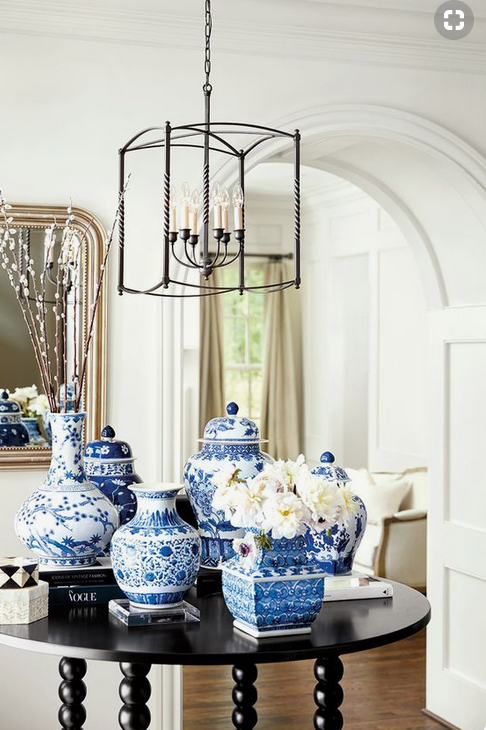 Wow, I never tire of the beautiful blue and white decorator accent pieces! The pieced plate would be a gorgeous addition to my small collection. Thank you. Blue and White provided me with a feeling of calm, tended well-being! Ah! Be still my heart! 💗💓 All the eye candy! You never grow tired of Blue and white! Blue and White will always be a classic. Your “Enchanted Home” is proof positive that trends come and go but classic pieces never go out of style. 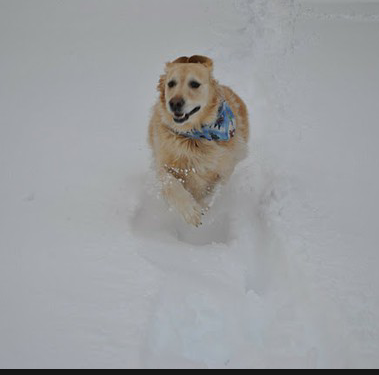 Love the picture of Teddy running in the snow! I love the blue and white and excited to start a new collection! Blue and White is always CLASSIC! Just love it! Thanks for sharing. One can never have too much blue and white! I’ve even gotten my 24 yr old daughter hooked! I love the out door porch you did for the show house. I like the touch of green with the blue and white theme. I want to do one just like it. Love blue and white and love your blog! This is the first time I have visited your blog and I will definitely be a frequent visitor! What lovely groupings of the blue and white. Thank you for the inspiration! All these pictures are beautiful, enjoyed them all! Blue and white is timeless and classic! So many beautiful pictures full of inspiration! Definitely a member of the Blue and White Love Club. All of the pictures are beautiful but the first-of your holiday mantel-was my favorite. I actually have a couple of lidded jars that I have told family they could consider for that purpose. I used to have a bumper sticker that said, “I bleed blue and white”. Probably a school color thing but I really meant it. Always such a lovely, classic look when blue and white are added! Thank you for all of the inspiration with this post! Love it all! I love blue and white everything!!! I love some of these pairings, blue and white is really classy and matches anything. I just love all things blue and white, and that pierced plate is gorgeous, of course!!!!! I simply love all of the gatherings of blue and white. Each one is unique! I very much enjoy the seven on Sunday. I always look forward to seeing what you come up with! So inspirational! And the giveaway piece is stunning! Thank you for all you do for your readers. I have just started a Blue and White collection! The pierced plate would be great to add! For centuries, people have loved blue and white- it is timeless and every other color goes with it! Personally, I love it with all shades of pink! Can never have enough blue & white! I have loved it for years & really love the pierced bowl for your give-away! The pierced plate is so versatile and so pretty! What a delight to view your photo collection of blue and white! Thank you for the beautiful inspiration! I have always loved blue and white, and enjoy seeing the way others display it so well. Blue and white is always a delight!!!!!!!!!!!! Thanks for the beautiful vignette ideas as always. I LOVE every picture! The dining tables are amazing! I have blue and white in pretty much every room in my house! This is my favorite blog, mostly because of the blue and white! Love this photo of Teddy. I’ve been a collector of blue/white since I was married 50 years ago. Stuck with it even while some of my peers thought it “old fashioned.” Now those same people wish they had half of my collection. You gave me some ideas such as taking it outside. Love that! I change my pieces around all the time. I must it is very refreshing to do that. One thing I try to resist doing, however, is using too much blue/white fabrics. I think the porcelains stand out more if not competing. I do have a navy blue dining room which is fabulous with Blue/white porcelain and whatever accent color in flowers that I’m in the mood for. Tina…you are an inspiration. Thank you. 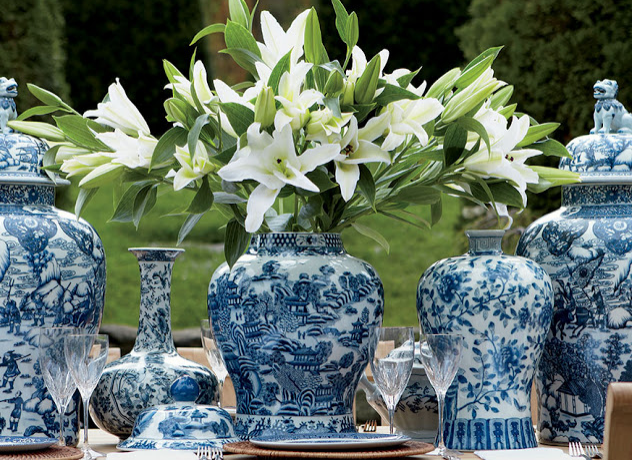 Mixing the blue and white ginger jars with plates is a beautiful idea. The variation in shapes and sizes is a real eye catcher. Beautiful homes!! Very inspirational! I love all the blue & white! What is not to like when it comes to blue and white! I have a new RL chinoiserie tablecloth and have been thinking of a special table for it to make its debut. I’d love to win this to add to my blue and white decor! I love this dish. I have a pierced blue and white jar that has the same patten. Just came back to my roots, collecting blue and white. Such a beautiful footed plate! Would dearly love to win it! Stunning page!! So glad I found it! Redoing my kitchen with French country inspirations with blue and white accents. How lucky I am to have stumbled across this amazing site. I now have my inspiration – thank you and merci beaucoup!